Trust The Professionals at Roads Paving For All Your Seal Coating Needs! In 1956, our father Thomas Henry opened the doors to his paving company. Through hard work and determination, he built a strong foundation for his family's future generations to follow in his footsteps. 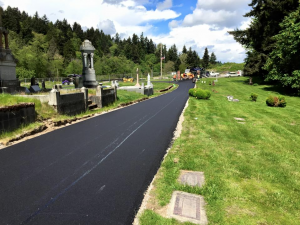 Today, three sons of his work alongside Thomas daily, and it's our hope that we will be able to see many generations to come after - paving roads and driveways across Washington to keep us connected to the community. Since Thomas started his company nearly 60 years ago, Roads Paving fosters the belief in old fashioned principles of business. Thomas Henry believed in treating each customer with courtesy and respect, being fair and honest and above all, being honorable and above reproach. He taught us that following these doctrines will drive clients back to Roads Paving time and time again. To help maintain your asphalt and protect it against the need for mostly driveway repairs, seal coating can help improve your paved driveway's appearance while also bolstering its level of protection from water damage, cracking or oil and gas stains. Wondering if you could do the seal coating yourself? The answer is yes, but it is a very labor-intensive project and very messy. Seal coat is very thick and sticky and can burn if it contacts your skin. It is recommended that the initial application be done by hand. Then, if practical, every application thereafter can be applied with a spray unit. We recommend seal coating your new driveway every year. 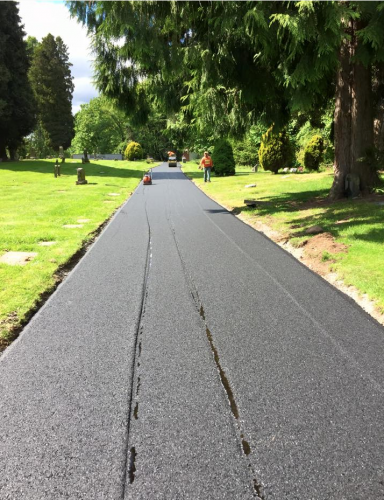 It also protects the pavement from water penetration, gas and oil spills and the ultraviolet rays of the sun, all of which can rapidly deteriorate an asphalt surface and make it less appealing and shorten the life of the product. Asphalt is prized for its strength and longevity, but poor maintenance, improper installation or the ravages of the elements over time can all lead to the need for asphalt repairs. Choosing the right paving, resurfacing and asphalt patching company is critical for avoiding unnecessary repaving expenses. At Roads Paving, our highly-qualified crews have been serving the Seattle area for over 60 years. They have the experience and skill necessary to handle the entire range of needed asphalt repairs from driveway patching to parking lot striping. "After a week or so, we scheduled the job to be completed. The guys showed up on the day and time they said and started the job. I was kept informed of the progress and due to weather, and to make sure the job was done right the guys had to come back the next day. They were on time as well on day two, put down a good base and got the asphalt down. Our new driveway looks amazing and we get comments on it all the time." "Roads Paving scraped the excess rock off the driveway, cut out part of the old driveway pad that was cracked, and installed the asphalt from the road to the driveway pad, and also along the side of our house where we park our RV. I called for an estimate and they were able to set one up right away. The owner came out and was very detailed with me, suggesting ways to make it aesthetically appealing. He then provided me with an estimate. My husband wasn't home at the time, so when i showed the estimate to him, my husband had questions. We called the owner and he got right back with us (even though it was a Sunday) and explained everything to my husband. We called to schedule the job and they were able to get us in within 2 weeks. They all arrived and went right to work, the driveway looks fantastic and we are extremely pleased. I would recommend Roads Paving to anyone who wants a professional job done at a reasonable price." 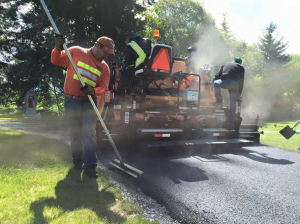 Contact Roads Paving to see how our professionals can help with all your Seal Coating needs! We proudly serve the Redmond area, so contact us and schedule your FREE estimate! ASAP!